Hi! 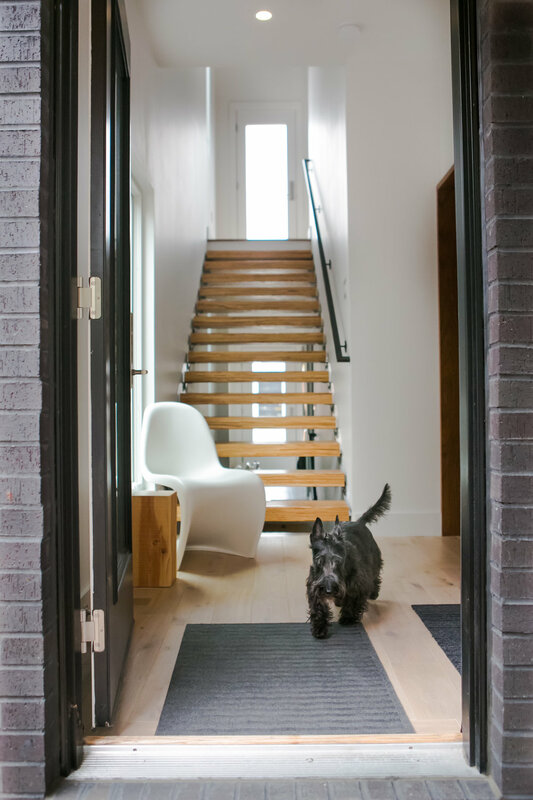 Meet Mac, a ten year old Scottish Terrier who gets to reside in this amazing modern urban dwelling in Indianapolis, Indiana with his owner, Joe Shoemaker. I’m sure you’re wanting to jump ahead and immediately look through all of the photos to see more of this home—I usually do the same thing too. However, you’ll appreciate it even more if you read a little about this home, what design considerations were made based on Joe and Mac's lifestyle, and characteristics of the neighborhood that it is a part of. This Indianapolis home occupies a narrow 33’ in-fill lot, that is surrounded on three sides by a city street and two alleys. 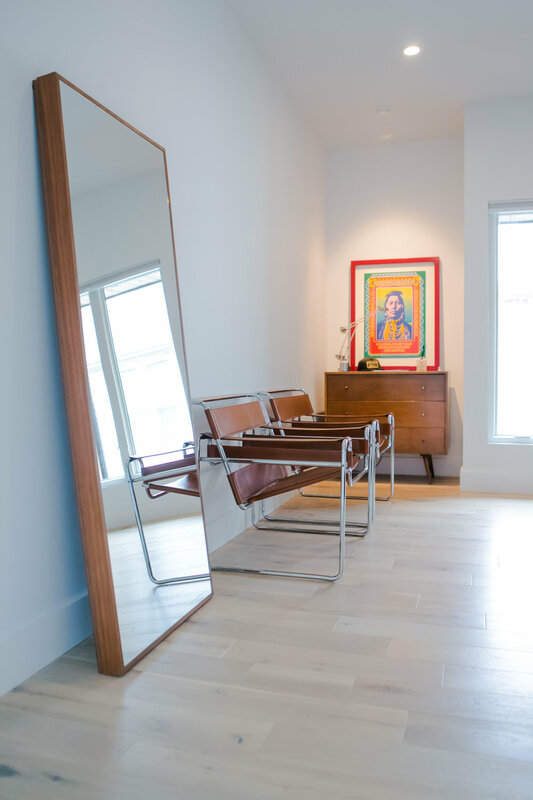 In the historic Fletcher Place neighborhood, architect One 10 Studio took careful consideration to appeal to the homeowner’s desire for a modern aesthetic, yet fit the fabric of the existing set of homes. “Of paramount importance was the opportunity to integrate the modern exterior aesthetic of the home into the traditional character of the neighborhood. The design parti employs an efficient 2-story masonry cube form flanked by single story, single pitched roof volumes to echo the scale and vocabulary of the adjacent neighboring properties. A horizontal datum of floor, porch floor and roof lines visually connect and nestle the home into its environment. The covered porch provides a nostalgic link between neighbors,” says Patrick Kestner, Associate at One 10 Studio. This home needed to be designed for Joe and his beloved dog, Mac. He did not need excessive amounts of square footage, but rather, desired a home built around the way that he lives. Most areas in the home serve dual purposes which means he covers nearly every square foot of the home on a daily basis. An avid Vespa enthusiast, the home and detached garage were designed with that passion in mind. In-line with the large glass expanse on the backside of the home, is a view, across a small backyard, of a glass overhead garage door where the silhouette of his Vespa can be seen. Opposite from the single glass garage door are two individual garage doors that open to a back alleyway. On the main level of the house, the homeowner occupies a home office, which could also serve as a bedroom, with a pocket door separating it from the main living space. The upstairs is an open-loft master bedroom and bathroom suite, while the basement also features a bedroom, spa-like full bathroom, and open living space. So while the home may not offer an abundance of square footage, each of the three levels of the home operates as completely independent living spaces equipped with everything one would need. And due to the careful design consideration to keep windows in a linear fashion across opposite ends of the home, one’s line of site is not interrupted from the front of the home to the back of the home. 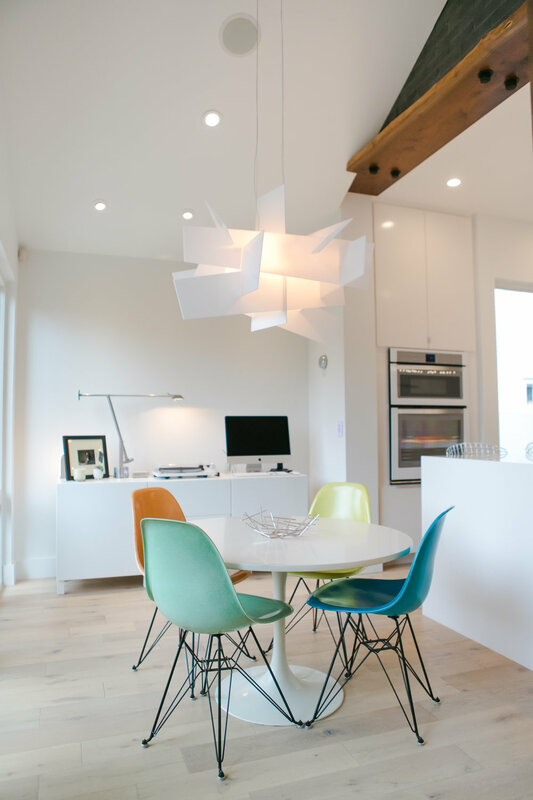 “From the start of the design process working with One 10 Studio, I handed over a 5 page summary of what I felt were life’s necessities to achieve a minimalist and low-maintenance modern home. I also included information on the things that I did not need—common things to the average traditional family like dining rooms, formal living rooms and elaborate walk-in closets, and excessive square footage were all things that I viewed an completely unnecessary for my lifestyle. Efficiency and low-maintenance quality finishes were of upmost importance,” says Joe. The interiors have a simple yet sophisticated ambience. This natural-light filled home complete with nearly all white finishes, is starkly contrasted with walnut wrapped portals offering egress between the entry way and vertical circulation of the main living space. 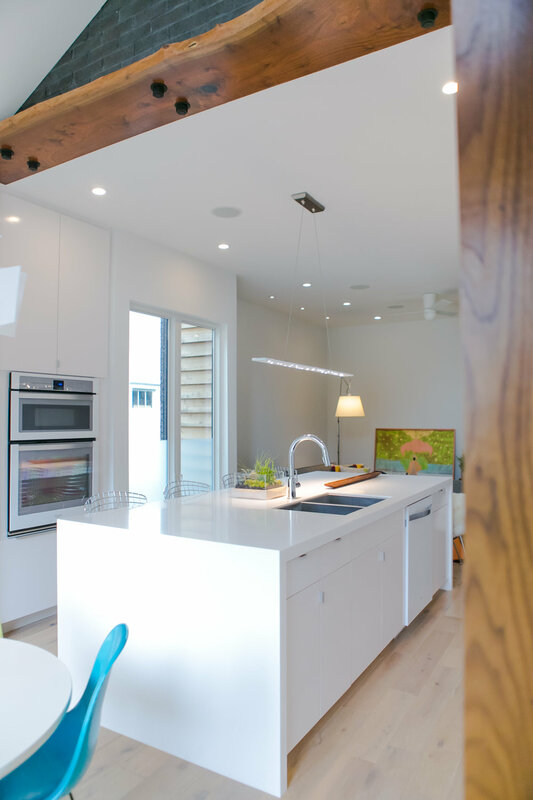 Additionally, steel details on the stairs and kitchen island, and sealed timberstrand wood beam treads in the open-riser staircase all combine to create an organic warmth inside a stark white interior. Beautifully and tastefully designed, Joe and Mac get to enjoy all of the common characteristics of modern architecture, while uniquely molding to their own minimalist lifestyle. This downtown urban dwelling is simply stunning and a remarkable structure fitting into the landscape of historic Fletcher Place. To see additional images, please continue to scroll down! 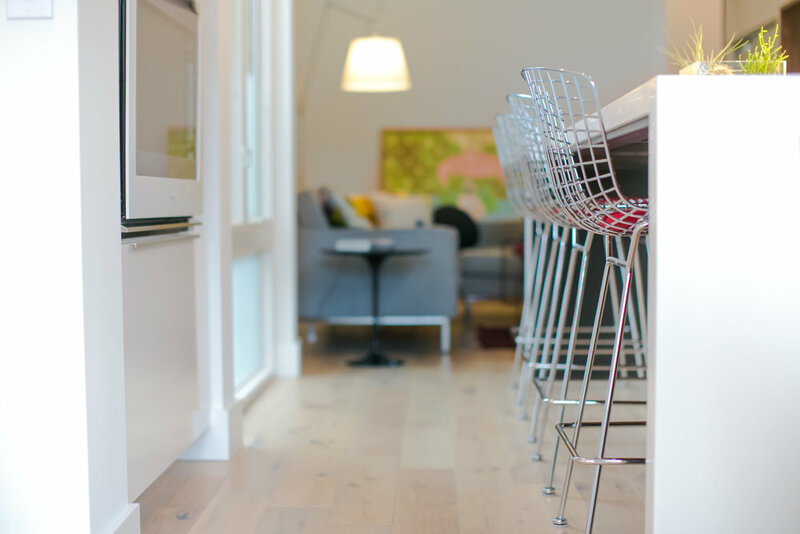 For more modern design inspired topics, make sure to visit my blog, Mod Abode, and follow me on Instagram and Facebook!